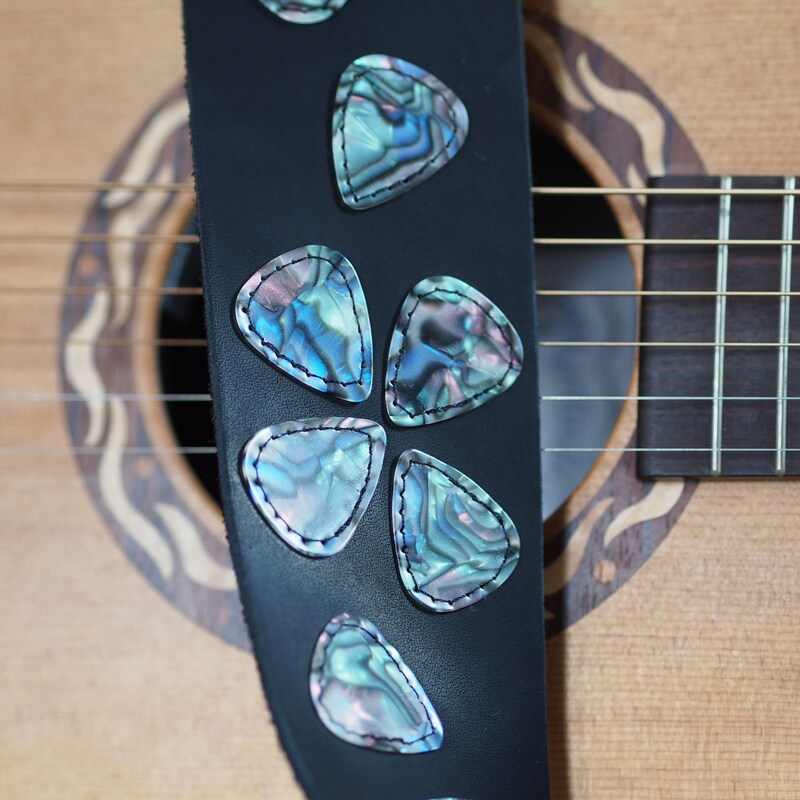 This all leather guitar strap is decorated with 21 abalone celluloid guitar picks, with a "flower" near the shoulder and randomly falling above & below. 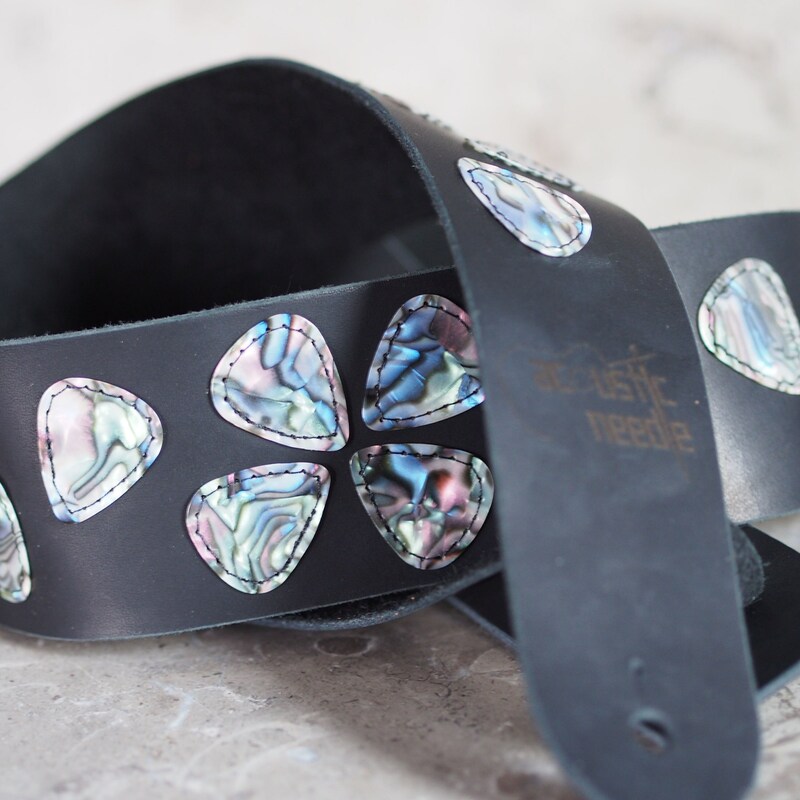 The abalone effect finish is similar to mother-of-pearl, and the colors change pending their angle to the light, and I've tried to capture this in some different angles of the same area. 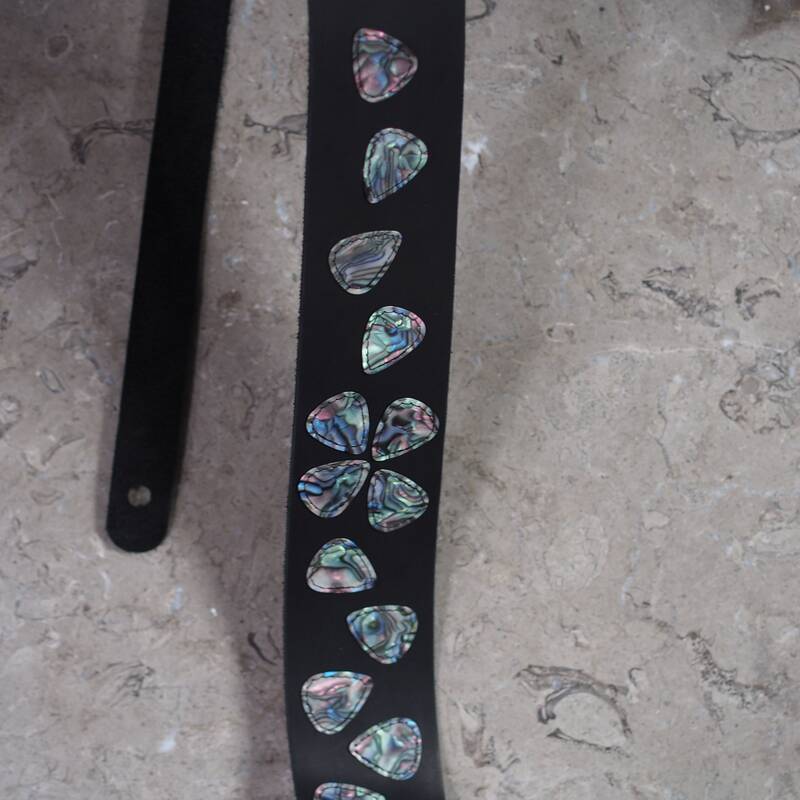 The picks were first dotted with glue to keep them in position on the 5-6 oz cowhide leather, and then stitched with black thread about 1/8" in from the edge of each pick. 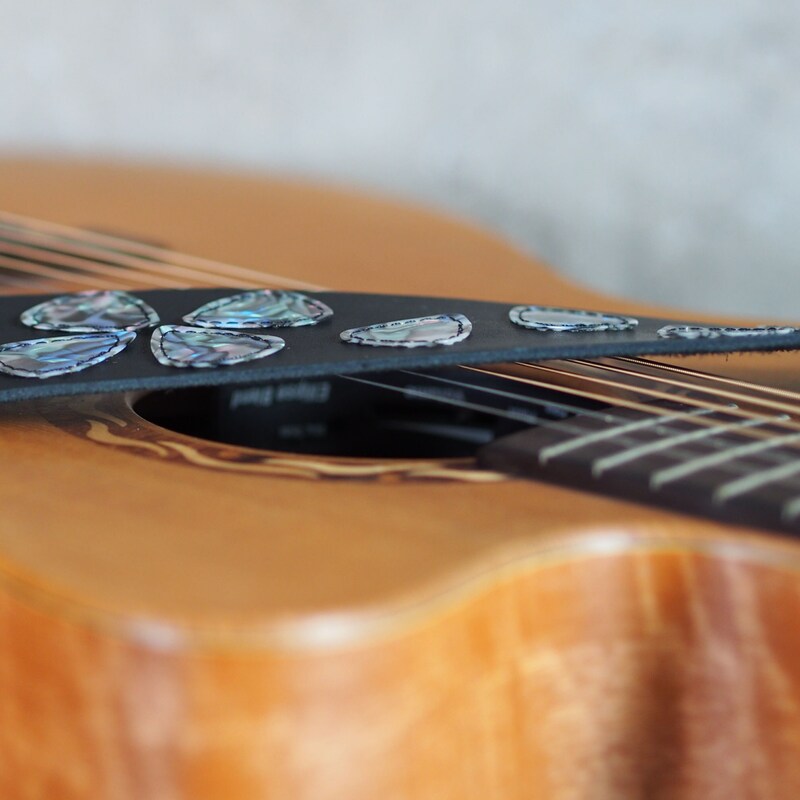 I positioned the picks so that the strap is still flexible, as shown in photos with it draped over my guitar's body (which is NFS) and even tight roll of the strap, with a standard sized business card which I've laser cut and etched for my "acoustic needle" line). 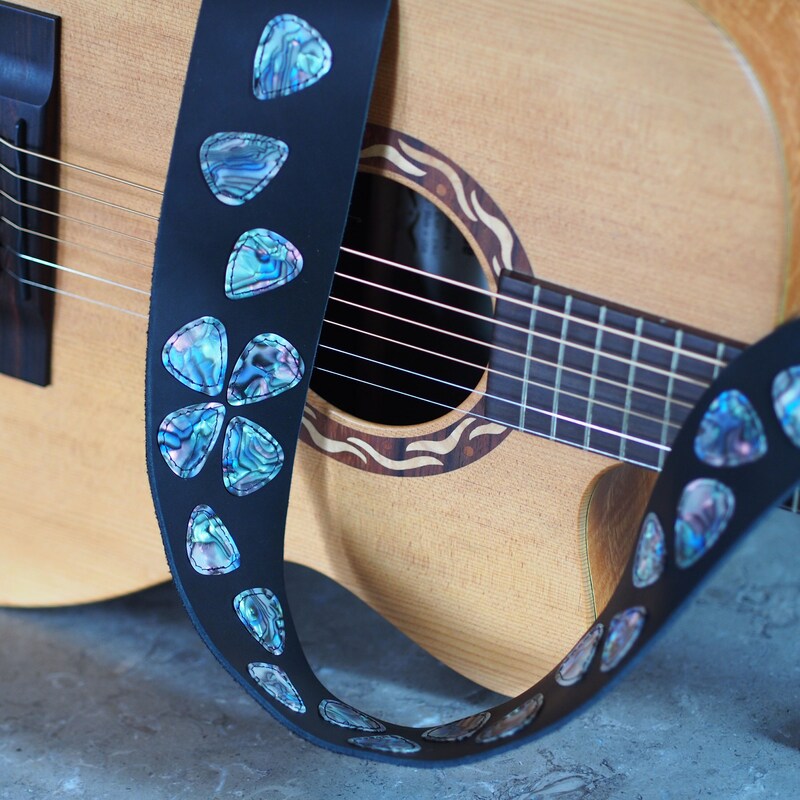 But the picks are not removable or usable in this design. 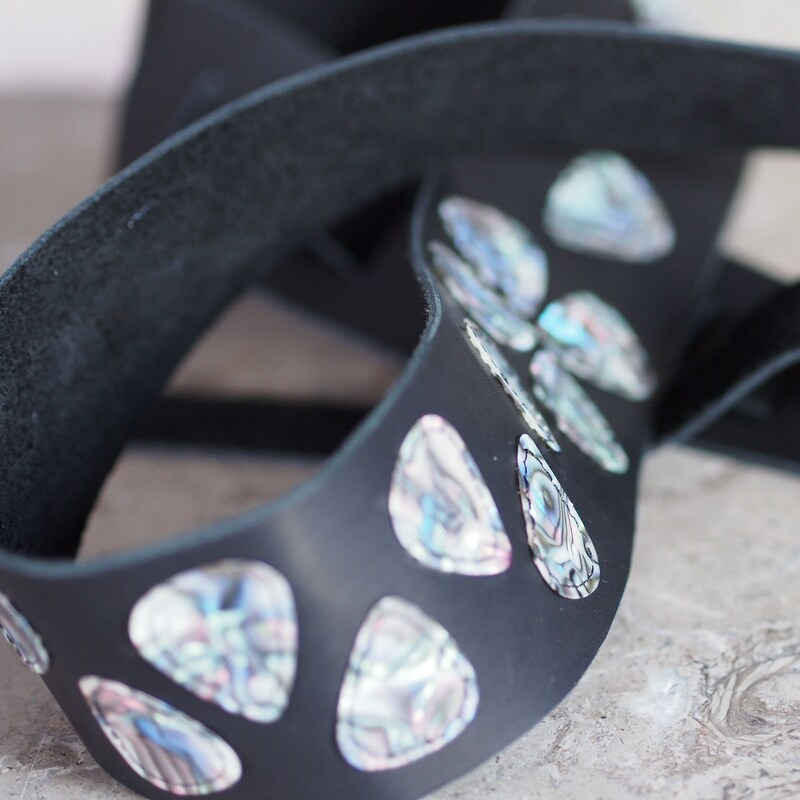 If you are interested in other leather colors or pick colors, or size, please convo me for custom order! 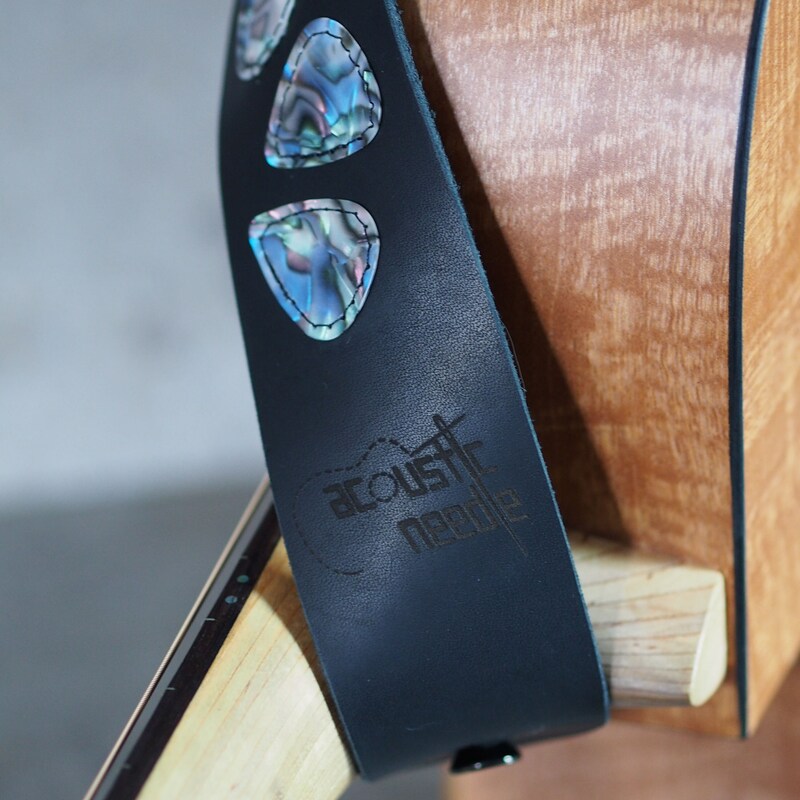 This strap also features my new logo specific to music accessories, "acoustic needle", and the logo is laser etched to the front just above the peg hole, and on the smaller adjustment strap. This is my standard strap width, at 2 1/2" wide, and tapers to about a 1 1/2" radius for the front peg end, and down to 2 1/8" width on the slot end. 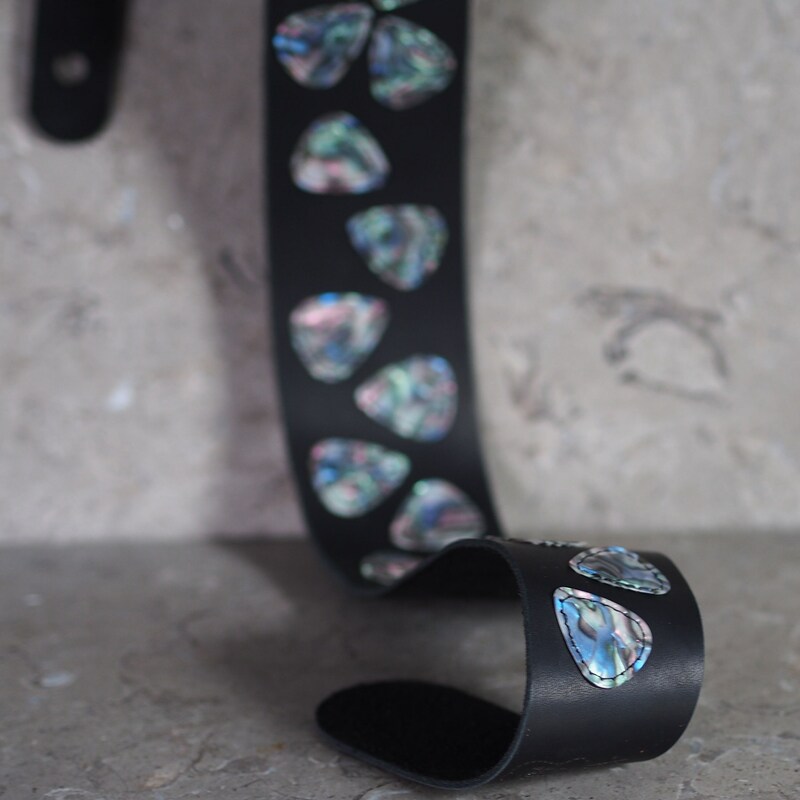 The overall length of this strap as shown is adjustable from about 47" to 58". 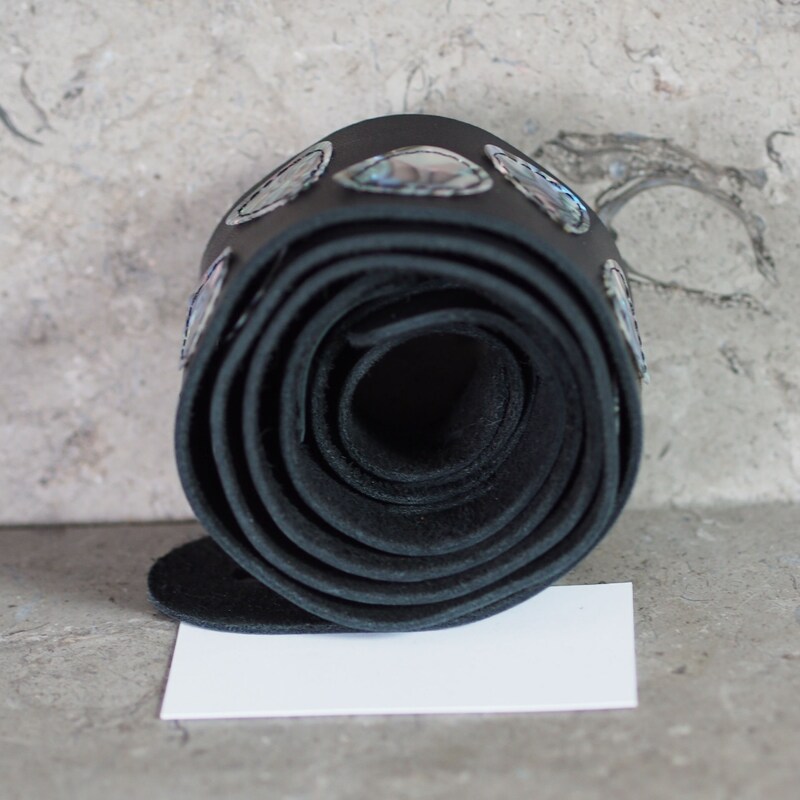 The main strap is about 42" long, and has 12 slots spaced from about 28" to 40" from the front peg hole. 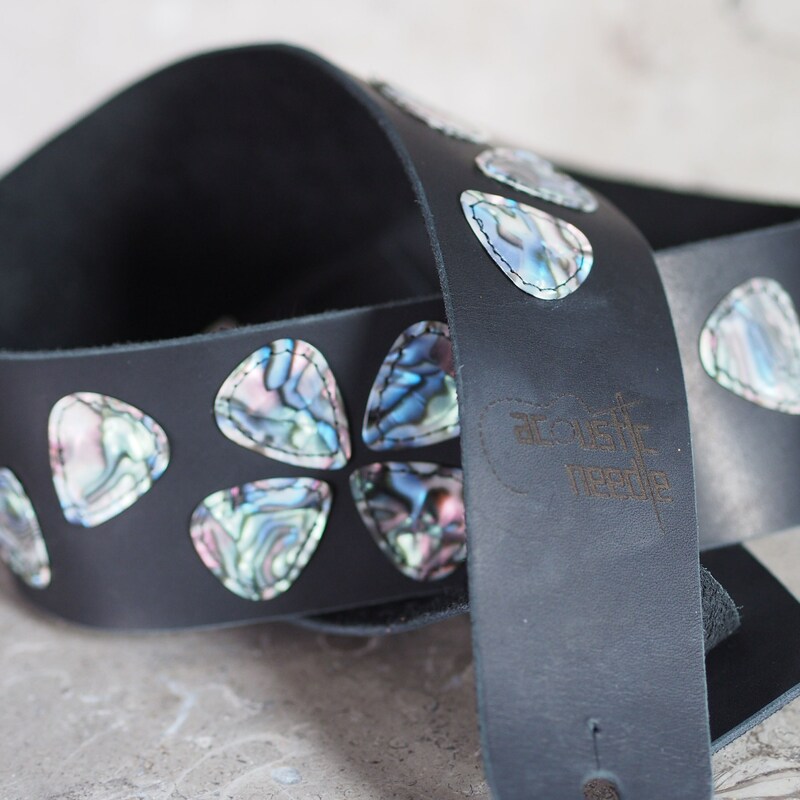 The adjustment strap is 18" from slot to its rear peg hole when installed. (I refer to the front peg hole being on the main strap, and the rear is the adjustment slot).